In his dealings during the League of Cambri Wars, Julius II proved himself a master of deceit and treachery, and at least as mendacious as Alexander VI. There are two reasons why Machiavelli probably singled out Alexander. First, according to Hale (- Florence) (p 180) Machiavelli was writing The Prince in 1413, the year in which Pope Julius died and the cardinals elected Giovanni de’ Medici, Leo X. Julius had gone to extremes to blacken Alexander’s name. 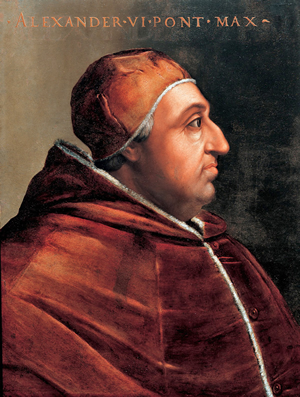 In addition, Alexander VI (Borgia) was Spanish, and it was probably safer to criticize a Spanish pope than an Italian one. 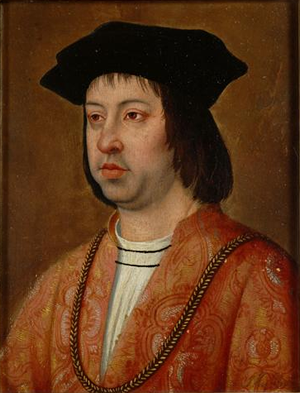 Second, Alexander VI (Rodrigo Borgia) was known to be a charmer. Mallett (- Borgias) (p84) quotes his tutor Garpar da Verona, as saying of the young Rodrigo that “He is handsome; with a most cheerful countenance and genial bearing. He is gifted with honeyed and choice eloquence. Beautiful women are attracted to love him and are excited by him in a quite remarkable way, more powerfully than iron is attracted by a magnet.” From a man’s point of view, Rodrigo was clearly already a young villain. In addition, Machiavelli was in office at the time of Alexander’s pontificate and during the time when his son Cesare threatened Florence. And you have to understand this: that a prince, especially a new one, cannot observe all those things for which men are esteemed, being often forced, in order to maintain the state, to act contrary to fidelity, friendship, humanity, and religion. Therefore it is necessary for him to have a mind ready to turn itself accordingly as the winds and variations of fortune force it, yet, as I have said above, not to diverge from the good if he can avoid doing so, but then, if compelled, to know how to set about it. For this reason a prince ought to take care that he never lets anything slip from his lips that is not replete with the above-named five qualities, so that he may appear to him who sees and hears him altogether merciful, faithful, humane, upright, and religious. There is nothing more necessary to appear to have than this last quality, inasmuch as men judge generally more by the eye than by the hand, because it belongs to everybody to see you, but given to few to come in touch with you. Everyone sees what you appear to be, few really know what you are, and those few dare not oppose themselves to the opinion of the many, who have the majesty of the state to defend them; and in the actions of all men, and especially of princes, which it is not prudent to challenge, one judges by the result. Reconquered Spain from the Moslems. Expelled the Moslems and Jews from Spain. In Chapter 21, Machiavelli does name Ferdinand and paints an unflattering picture of how he used the pretense of religion to hide his imperialistic enterprises. Here he adds a corollary, which is that since a prince cannot afford moral virtue, but also cannot afford to be hated or despised, he must be deceitful. He must pretend to be merciful, faithful, humane, upright, and religious. Every modern election cycle reminds us that politicians do not need Machiavelli to teach them to observe this corollary.